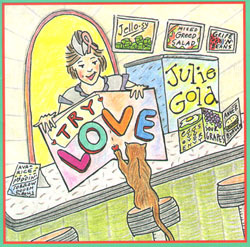 "Try Love" (the follow-up to her 1998 release "Dream Loud") is a 14-cut collection of studio recordings that Gold has created en route to placing her songs with some of the country's best pop singers. The album includes her original studio versions of "Southbound Train" (recorded by Nanci Griffith) and "The Journey" (recently recorded and released by Kathie Lee Gifford) and complete lyrics and notes about each song. Best known as the writer of "From A Distance" (winning the Grammy for Song Of The Year in 1990), Gold has been writing and performing since the '70s, often winning accolades for her heartfelt performances of her deeply personal songs. She has won legions of fans among the country's best singers, leading to covers of her songs by Bette Midler, Nanci Griffith, Judy Collins, Kathy Mattea, Andrea Marcovicci, Patti Lupone, and many others. In addition to her success as a writer, Gold also toured the country and recorded a CD as a member of The Bitchin' Babes, with Christine Lavin, Sally Fingerett, and Megon McDonough. She has also played numerous solo shows, including a recent weekly club engagement at the popular New York City nightspot Eighty-Eights. Originally from Philadelphia, Gold attended Temple University in the mid-'70s then moved to New York in 1978 to pursue her dream of being a songwriter. Though she immediately caught the attention of her peers and observers of the local scene, it wasn't until Bette Midler had a megahit with "From A Distance" that her career as a songwriter was solidly established.